Chef Chad White's lobster bar has greatly exceeded expectations. On the silent open, a few dozen lobster rolls sold only to specially invited guests disappeared in less than 30 minutes. The second day, with no official opening announcement made, people were already lined up the moment chef Chad White and Josh Neumeier opened the door to High Tide lobster bar. They sold more than 130 rolls. News quickly spread through Instagram, where people saw photos of the toasted, buttered rolls stuffed with chunks of lobster claw and knuckle meat in a tarragon mayonnaise sauce, and by that third day, more than 160 rolls went out the door. "The minute that door was open people were like, 'Oh my god! Lobster rolls!'" White says. With a business plan based on selling 30 or 40 rolls per day, the lobster for that first week was quickly gone. The three-person crew that also includes Necole Flerchinger had to scramble. High Tide closed for a few days while more lobster was overnighted from Maine — and more rolls, also produced on the East Coast. The next several days after reopening were even more successful. "I own restaurants in two different countries, in two different states, and I've never experienced a, let's call it a 'lob mob,' you know what I mean?" White says. "We really didn't expect to have this much success, so we had to, on the fly, find a way to fix it, which in my opinion is an incredible problem to have." 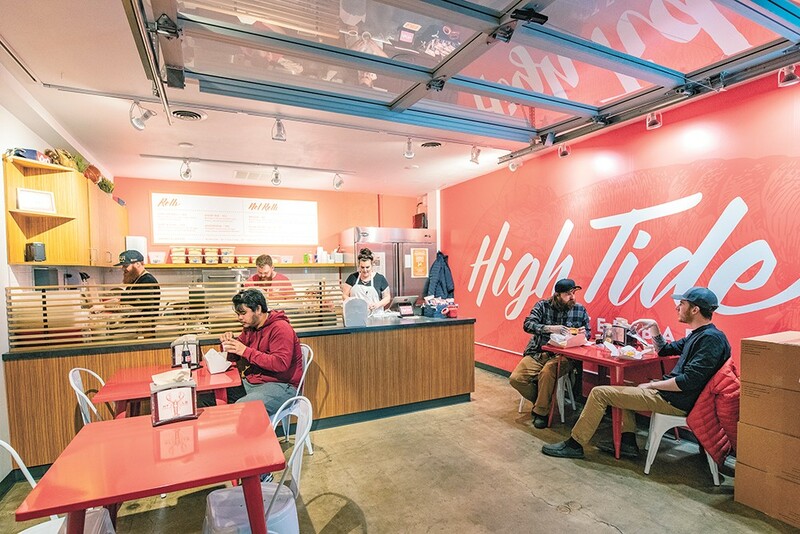 High Tide's official address is 502 W. Riverside, Suite 204, but one of the easiest ways to find it is to enter through the U.S. Bank building across the street. Take the escalator to the second floor, take a left past the coffee bar, cross the skywalk and you'll spot the red and white tables and chairs just outside the counter-service space. White's menu is intentionally short and sweet. There's the traditional lobster roll, served with 3.5 ounces of lobster meat ($16), a surf-and-turf roll with beef short rib and lobster ($14), a short rib roll ($12) and a mushroom roll ($10). High Tide also serves clam chowder ($6+) and wedge salads ($9), with chips, drinks and ice cream also available. White knows that some see the price tag and think it's steep, but he's really tried to keep it affordable. "Lobster's not cheap. It's one of the most expensive creatures in the ocean. So when people come here and they say 'it's expensive,' well yeah, it is expensive, it's a luxury item," White says. "If you go to Maine or anywhere in Massachusetts and you order a lobster roll, which we've done, we did our research ... most lobster rolls on the East Coast cost between $20 and $25 for the same amount, same size bun." So when you factor in the cost of shipping the product across the country, White says he actually opted to take a smaller profit in order to make a more affordable roll. While exciting, the lobster bar's gangbusters success in its early weeks has also meant disappointment for some folks not able to buy a roll when they show up. When they've sold out, they've really sold out, which White says he hopes people can understand. That's how popular places operate in a lot of big cities. But he's also quick to note that a few weeks in, most of the kinks have been worked out, and people are filling the restaurant's 16-seat capacity and taking orders to go throughout the lunch rush. Things will likely even out as time moves on, but for now, White says he and the team are riding the natural high and excitement of opening a new eatery. The original print version of this article was headlined "'Lob Mob' Greets High Tide"